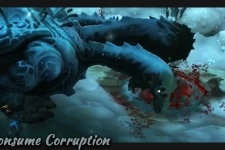 Welcome to my Mythic Guide of Fetid Devourer in the Uldir raid. Here I’ll do a breakdown of both general strategies and how I heal this encounter. Click on the headlines to expand and subtract the texts! I hope you can find a few tips and tricks to help you in your Mythic endeavors! The experiments within Uldir conducted tests upon countless lifeforms, including several loa who inhabited the forests around Zandalar. After the experiments proved lethal, the loa’s remains were disposed of improperly, much to the delight of the dark consciousness imprisoned within Uldir. area each time it deals damage. Corpuscle that casts Enticing Essence more slowly. every 2 sec. while affected by Enticing Essence. 2 sec. while affected by Enticing Essence. The primary tank will take consistent damage, while the off-tank will take high damage from Terrible Thrash, cast every fourth melee hit. Top up the off-tank whenever this ability is about to hit. Keep track of the boss’s Thrashing Terror buff to see at which cast he is at (3 stacks total, he depletes one stack with each melee hit). Players will be afflicted by Malodorous Miasma, an 18 sec debuff that ticks moderate damage. 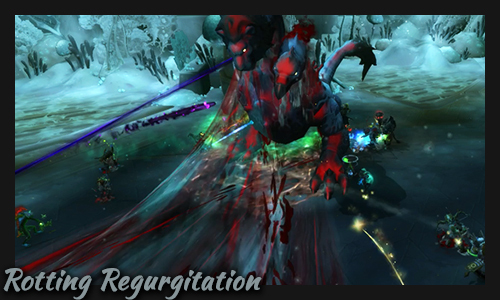 Once it the duration runs out, it evolves into Putrid Paroxysm, a 6 sec debuff that ticks high damage. Both debuffs can stack if the affected player is hit by boss mechanics that also apply the debuff. Since raid-wide damage only hits a few times this fight, you will spend most of your time focus-healing the targets with Putrid Paroxysm. Remember to keep affected targets healthy before large incoming damage. 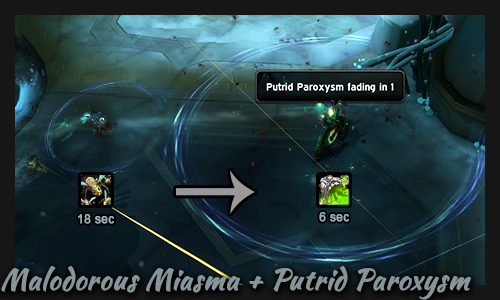 MYTHIC: On Mythic difficulty, both Malodorous Miasma and Putrid Paroxysm will spread to other players each tick. The circle around the player indicates the range of the spread. 100 Energy: The Fetid Devourer casts Rotting Regurgitation, a frontal cone attack that must be avoided. Getting hit causes damage, knocks you back, and applies a stack of Malodorous Miasma. A pair of the 6 alcoves of the room, the Waste Disposal Units, will occasionally activate and flood the alcove with waste. Getting hit applies a stack of Malodorous Miasma. The waste also spawns an Corruption Corpuscle add. These should be killed before they finishes their Enticing Essence cast. If the cast goes through, the boss will run over and eat up the add with Consume Corruption, gaining health and energy. 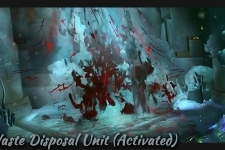 MYTHIC: On Mythic difficulty, Fetid Devourer will also spawn a third add called Mutated Mass. 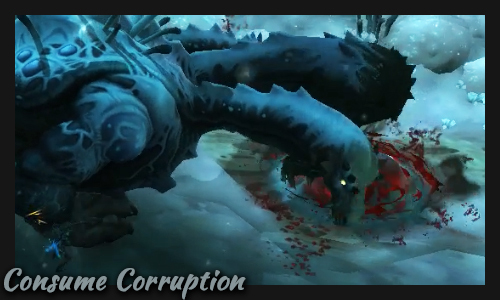 This is a larger version of the Corruption Corpuscle with more health. It casts Enticing Essence as well, but at a slower rate. 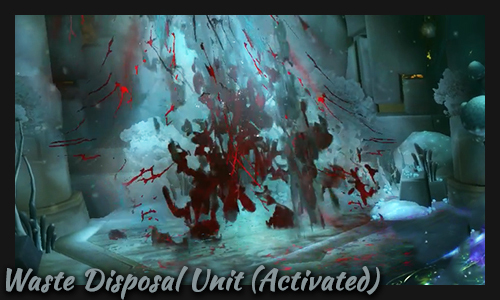 The Mutated Mass always spawn in one of the two middle alcoves. 50% health: Fetid Devourer will take increased damage due to Fetid Frenzy. The damage buff will also cause the tanks to take higher damage! HEROIC: The boss will also cast Shockwave Stomp which knocks players way back. Keep a wall behind you so that you don’t get knocked to the other end of the room. 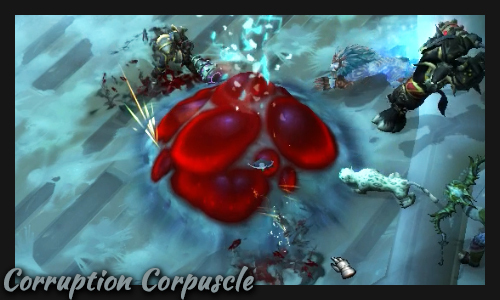 HEROIC: Corruption Corpuscle will also heal while casting Enticing Essence, making them slightly more arduous to kill. This fight is rather plain for healers overall, there’s little enough to do. The hardest part will be to get the adds down before the boss consumes them, which mainly the DPS handles. The second hardest part is not to spread the debuffs too much, which is everybody’s responsibility. Healers should have loosely designated corners of the room, so that theoretically every player will have a healer close by. Don’t get locked in your corner however if the raid is in another position, you have to be flexible. 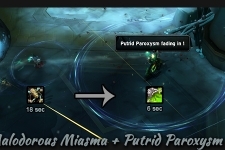 The main incoming damage you need to keep an eye of is the Putrid Paroxysm debuff. Keep track of who has those, and focus-heal them. This fight will mainly call for single-target healing, so talent for that. Keep close to the wall, or one of the 4 “pipes” in the rooms, when Shockwave Stomp is about to hit. Try to position yourself so that when you get knocked back, you won’t stack up with other knocked players and accidentally spread the debuffs. You can also nestle yourself into one of the bushes or plants to prevent flying too far. Summarized: take position, avoid spreading the debuff, dodge bosses frontal cones. Healers should focus heal the players with Putrid Paroxysm. You can keep a Transcendence spirit up close to the wall for a quick re-positioning when Stomp is about to hit. Whenever you personally don’t have the debuff, run into the middle and cast Essence Font if there’s 6+ players who can benefit from it. Use Soothing Mist + Vivify on the players with the debuff. Cast Enveloping Mist if you know it won’t overheal (especially if you’re the only healer nearby). Mana will be a problem due to the heavy single target healing. Keep yourself paced, use Enveloping Mist efficiently but rely mostly on Vivify. Revival doesn’t have a clear place, cast it when appropriate. Don’t channel Potion of Replenishment if either Rotting Regurgitation or Shockwave Stomp is less than 10 seconds away.